There is truly nothing quite as adorable as puppies sleeping, eating, playing, or just being! They make people smile and give so much joy. There’s plenty known about baby puppies but you know the old adage “each one teach one”? Well, we’re sharing our wealth of knowledge. We’ve gathered five interesting facts about puppies! Did you know they have been successfully cloned by scientists? In 1996, there was the first successful mammal clone. Nine years later, geneticists in South Korea used the same process for the world’s first clone of a canine. It was an Afghan hound named Snuppy, who died in 2015. After his death, it was discovered researchers clone four babies puppies from his stem cells. Sadly, one of the pups died a few days after its birth, but the other three survived. Did you know that Dalmatian puppies are born spotless? Beloved by firefighters and Disney enthusiasts the world over, they are one of the most recognizable dogs, because of their spots, of course. Did you know, however, that they are actually born without spots and completely white? Their infamous spots start to appear after 3 or 4 weeks. Did you know that baby puppies’ yawns aren’t contagious? You know how it is when you notice someone yawn and you’ll catch it and start yawning and vice versa? The same doesn’t apply to baby puppies. In a 2012 study, Swedish researchers took a group of 35 dogs between the ages of 4 and 14 months old on monitored play dates, feigning yawns in front of each individual animal. The baby puppies that were less than 7 months old didn’t flinch one bit! Their patterns were surmised to be comparable to children around the age of 4 who eventually find yawns contagious. 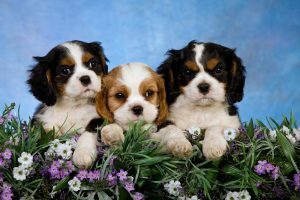 Did you know that baby puppies can have identical twins? It may seem like they’re all “twins” since they’re born together of the same litter, but it is a little more complicated than that. It’s not a common occurrence, let us be clear on that, but it has happened. In 2016, a South African veterinarian, noticed something unusual while performing a C-section on a pregnant Irish Wolfhound. There were two placentas that two of the seven baby puppies shared. They were later tested and it was verified that they were genetically identical. It was the first confirmed case of identical twin baby puppies in the world. Did you know that baby puppies take a lot of naps? Much like children, baby puppies need a lot of sleep – like a lot of sleep. We’re talking about 15 to 20 hours a day! They need their rest and so it’s recommended that parents of baby puppies allow them to sleep without many disruptions. We know it’s hard, because they’re so stinkin’ cute, though!